Split the potatoes in the middle. Fry on a frying pan in clarified butter, ghee. lard or tasteless oil until they are nice and brown. The basic principle is to use 1 small potato, 1 egg and 1 tbsp sour cream or whipping cream. Then you just multiply until you got the amount you need. Sour cream is better than regular cream as the sourness contributes a lot to the flavor. If you don't have sour cream in the house, regular whipping or heavy cream will do just nicely. 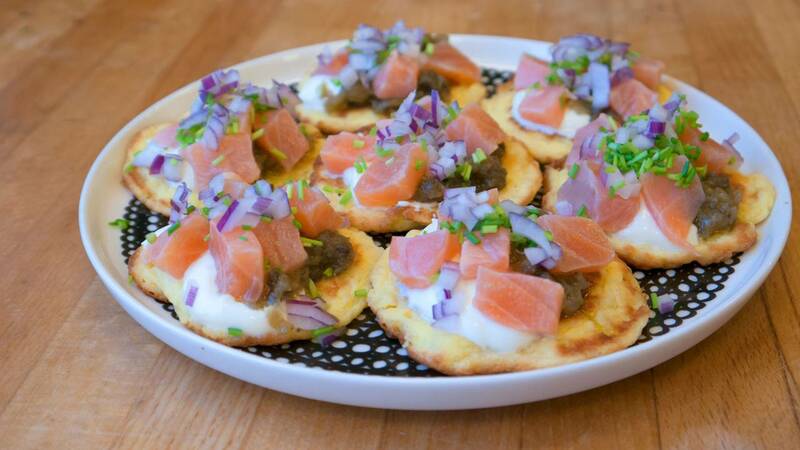 You cannot use yogurt or other low fats products as it will make the blinis' seperate.. Sorry no real recipe for that. Just something I made up on the fly. As far as I remember it was: Baba ganouche, Icelandic skyr, ceviche, red onions and chives. The cevice was made by salting a side of thawed salmon overnight in the fridge. Use plenty of salt to force some water out of the slamon. Rinse of the salt, and then let it dry of until you want to use it. I Cut it up in 1/4-1/2 inch cubes that I marinated with lemon/lime juice for about 15 minutes.